The hand-wringing has rung out from every corner of Red Sox Nation : How on Earth can Boston compete this year with such a weak offense? The same way the Red Sox always have: By grinding other teams down with an unfailingly patient approach. the Yankees’ 663 free passes). This isn’t some recent trend either. Expect the Red Sox to rank near the top of the league in those categories again this year. players). They are: Jacoby Ellsbury (12), Kevin Youkilis (24), Dustin Pedroia (51), and David Ortiz (76). Next, consider the off-season moves the team made. Replacing the unholy alliance of Nick Green, Julio Lugo, Alex Gonzalez and Jed Lowrie at shortstop is Marco Scutaro. but he’ll do his part to turn the lineup over. to a mediocre .238/.332/.462 mark in ’09) and a full year of Victor Martinez (.303/.381/.480 in ’09) at catcher, replacing the rapidly declining Jason Varitek. 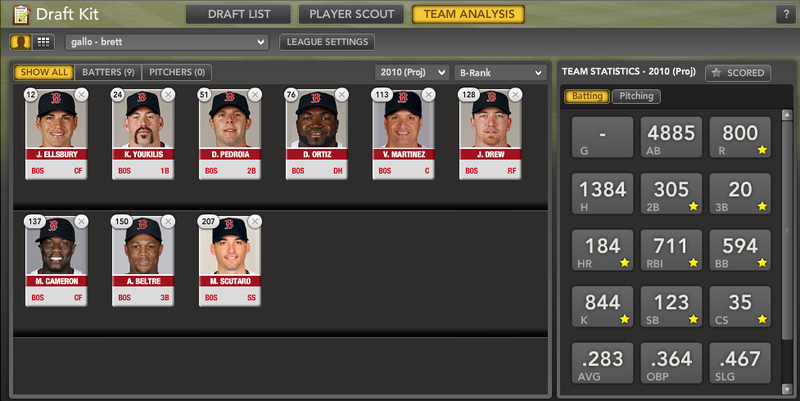 Note the composite projections for that lineup: .283/.364/.467 (AVG/OBP/SLG). Those numbers would rival any team in baseball if they come to fruition. the ability to avoid those outs.